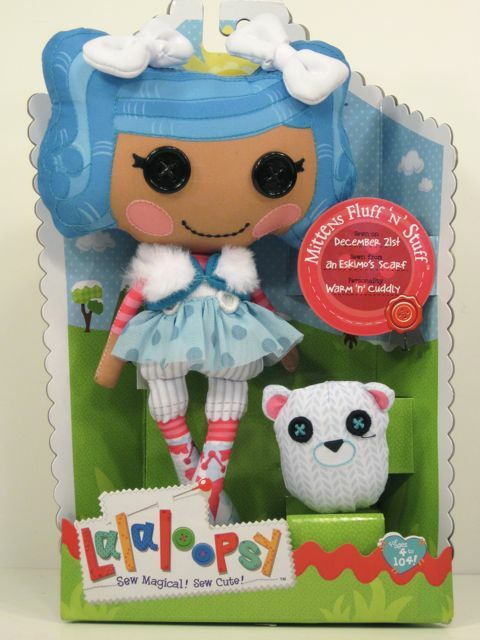 You might remember that when I reviewed the Lalaloopsy Marina Anchors doll, my biggest complaints about her were her price tag, her packaging and her unruly top-heavy body. I was also conflicted about the notion of a plastic rag doll. I appreciate the superior durability of a plastic doll, and I also admire how MGA gave the Lalaloopsy dolls floppy articulation to mimic a cloth doll, but it seems to me that a magical doll who, "comes to life when her last stitch is placed," should probably have some actual stitches in her. 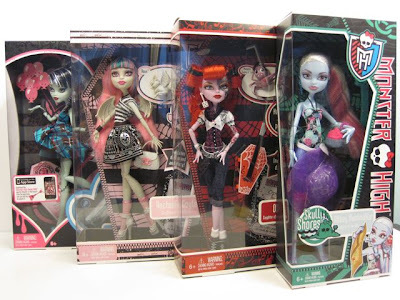 The reason I asked everyone to share a favorite doll during the Monster High Cupid giveaway is that I love learning about new kinds of doll. I had a wonderful time learning about the dolls that were mentioned. I think the Jude Deveraux Barbie is lovely, the Fisher Price My Friend doll looks like the perfect companion for a young child, and the Sleeping Beauty Barbie, whose eyes can close, is something I should compare to the Sleepover Party Liv dolls some day. There was one doll mentioned, though, that stood out to me as something I should investigate immediately--the Little Apple Doll. 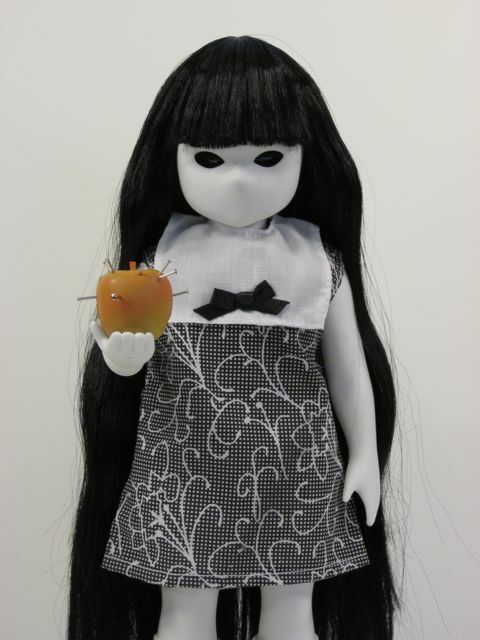 Little Apple Dolls are 14 inch vinyl dolls with an eerie, minimalist appearance that conjures Japanese kabuki theater and goth horror. These spooks are the creation of British artist Ufuoma Urie ("Yurei"). Yurei's strange, otherworldly dolls were sold by Underground Toys until 2008, when the company decided to drop the L.A.D. line. Currently, Little Apple Dolls are being made in small editions by Yurei and sold through her company, Screaming Matriarch (love that name). 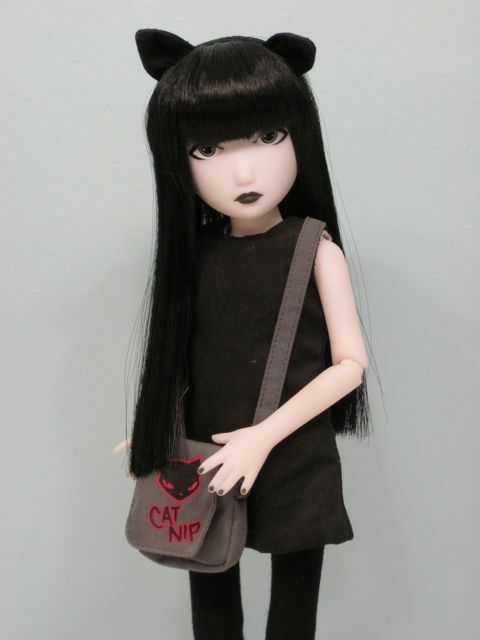 The new dolls have clothes that are designed and hand sewn by the artist herself. 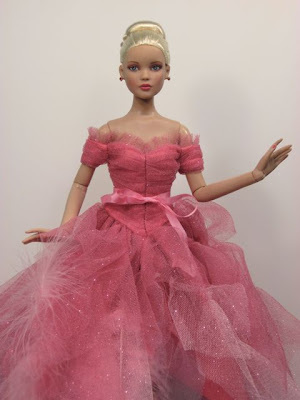 Typically, when fashion doll pre-order season comes around each year, I select a few Tonner dolls with Cinderella faces to add to my collection and that's about it. This leaves me in a position where I can get out the popcorn, sit back, and watch the chaos that surrounds the yearly Integrity Toys pre-order extravaganza. I have tried once or twice (half-heartedly, I'll admit) to buy a new Integrity doll, but by the time I get my act together, the dolls I want are always sold out. Why are these dolls so popular? Well, the edition sizes are pretty small (400-600), and the dolls are also Barbie-sized, so they fit nicely into the collections of established Barbie fans. Furthermore, Jason Wu is a brilliant designer and many people want to own something he has created (have you seen his clothes at Target, by the way? They are very nice). But I also suspect that there's another intangible element to these dolls that makes them so tempting--a kind of "X factor." I do own a few Integrity dolls, but only ones that don't sell very well for some reason. For example, I got my 16" AvantGuard dolls on a big clearance sale and I found my I.T.B.E. doll collecting dust at an online shop two years after her release. I really like these dolls, though, and that got me thinking that if mine are the undesirable Integrity dolls, the hot dolls must be pretty spectacular. So, this year I decided to put a little more effort into my quest for a popular Integrity doll. 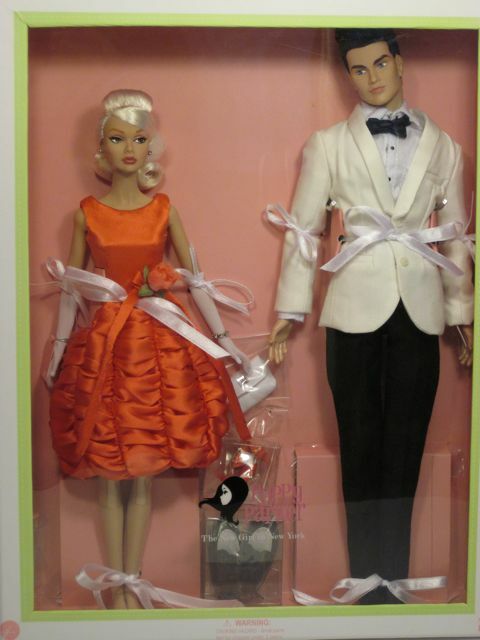 Poppy Parker and Chip Baby it's You gift set. 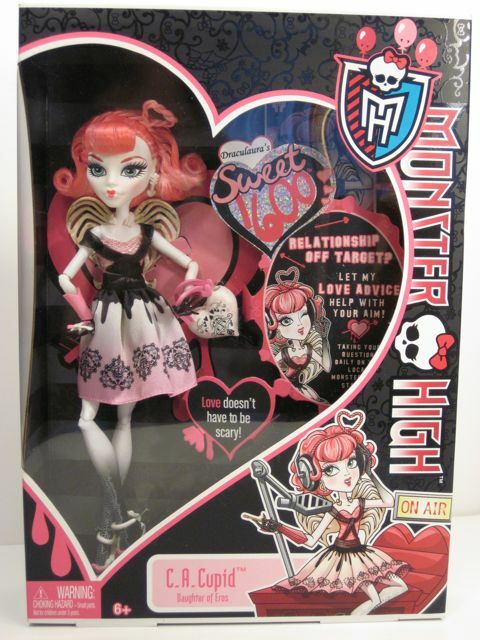 Monster High Cupid Giveaway Results! The time has come to see who wins the elusive Monster High C.A. Cupid doll! I love giveaways, but I hate that not everyone can win. I wish you could all win. I've only ever won one thing in my whole life I think--my dad and I won a quilt raffle once when I was a teenager. That was pretty awesome. 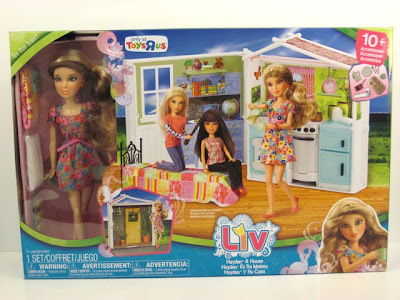 Also, I loved reading through your descriptions of favorite dolls! I learned about a few dolls I had not been aware of, and I added a few dolls to my wish list. I got a new idea for the blog, too. I think once a week I'll share a doll from my collection that doesn't need to be reviewed, but just wants to show off. Kind-of and oldies but goodies feature. We'll see how that goes. 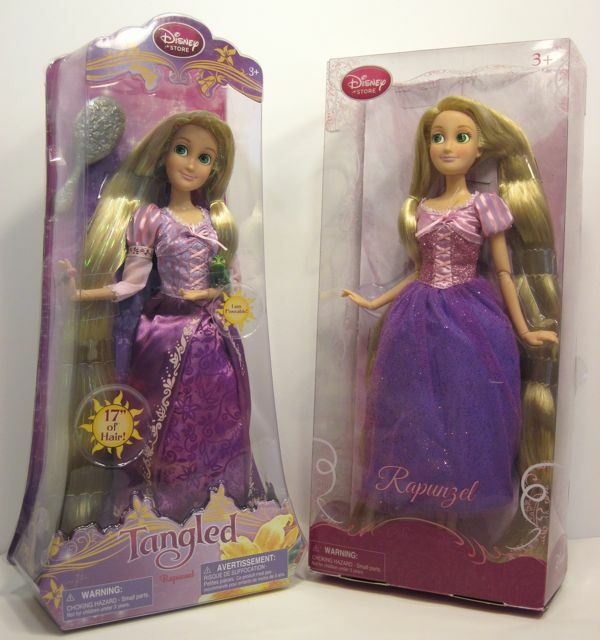 I'd like to review a few more of the Rapunzel dolls I bought during my crazed Tangled obsession last month. As a bit of an aside, the first Rapunzel doll I ever bought was actually Robert Tonner's 16" Rapunzel, who was an FAO Schwarz exclusive in 2008 (way before the Disney movie). This doll was expensive ($200) and massively disappointing. I actually sent her back to the store. Her hair was thin and uneven and her outfit was of poor quality for such a pricey collector's doll. She was nothing like the exquisite FAO Schwarz Cinderella Rose exclusive. Anyway, the Tonner company redeemed itself big time with the Disney Showcase Tangled Rapunzel, but she's pretty expensive. What about a Rapunzel doll in a more affordable price range? Well, both Mattel and the Disney Store have a variety of 12" Rapunzel dolls based on the movie, and these range in price from just under $13 to about $30. I prefer the Disney Store version of Rapunzel, mostly because her face is unique and more reminiscent of the quirky movie character. When Tangled first came out, my niece got one of the $12.50 12" Disney Store Rapunzel dolls, and I was very surprised and impressed by the doll's articulation and quality. I immediately bought one for myself, of course, but for some reason I have never taken her out of the box. I was looking at the Disney Store the other day and noticed that the newer version of this Rapunzel doll is actually a bit different from the original. This demanded further investigation. I ordered the newer version and in this review I'll de-box the newer doll and compare her to the older Rapunzel...and I'll also compare her to the Ever After wedding version of the same doll. Giveaway is now closed to new entries--winning names are posted, above! It's been raining in Maine for what feels like forever. It's good for the flowers, I know, but after a while, it gets kind of old. To cheer things up, I decided to do a giveaway! The Monster High poll is now closed. Thank goodness. The all-caps heading on that poll was giving me a headache. Anyway, with a healthy 64% of the vote, Cupid won the distinction of being the hardest Monster High doll to find in stores. This isn't surprising, really, since she's a Valentine's Day themed doll exclusive to Walmart. Skull Shores Frankie got second place, but if the five zillion Skull Shores Frankie dolls at my local Toys R Us right now are any indication, that information is slightly out of date. I managed to get my hands on a Cupid the other day. Here she is--and she could be yours!